The polio titer test checks the polio antibody blood level to look for evidence of polio immunity. What is a polio titer? A polio titer measures the poliovirus antibody blood levels. Why is this polio test important? This polio titer checks for evidence of polio immunity in the blood. Who gets this polio titer test? This polio blood test is ordered by people looking to prove immunity for personal requirements or school / work requirements. This Polio Titer is a blood test. It typically takes 8 business days or less. The polio titer measures the blood levels of polio antibodies which helps determine whether someone is immune to polio or not. While the polio titer is not commonly needed for job and school requirements like the Hepatitis B titer, MMR titer and Varicella titer tests are, the polio immunity test is still required by a handful of organizations. Additionally, the polio antibody test is helpful if someone is traveling in an area where poliovirus still exists and wants to confirm immunity after having previously received the vaccine. Some people are surprised to hear that a poliovirus antibody titer test actually exists. Historically, when people were unsure of their polio immunity status, they would simply get revaccinated with a polio immunization. As polio blood titers have become more widely available, particularly through the use of technology, people now have the option of getting blood testing before going through the process of getting another immunization. This particular polio blood titer checks for antibodies to poliovirus types 1 and 3 (PV1 and PV3). Some polio blood tests used to check for poliovirus type 2 (PV2) but it has been declared eradicated in the wild after being last seen in India in 1999. 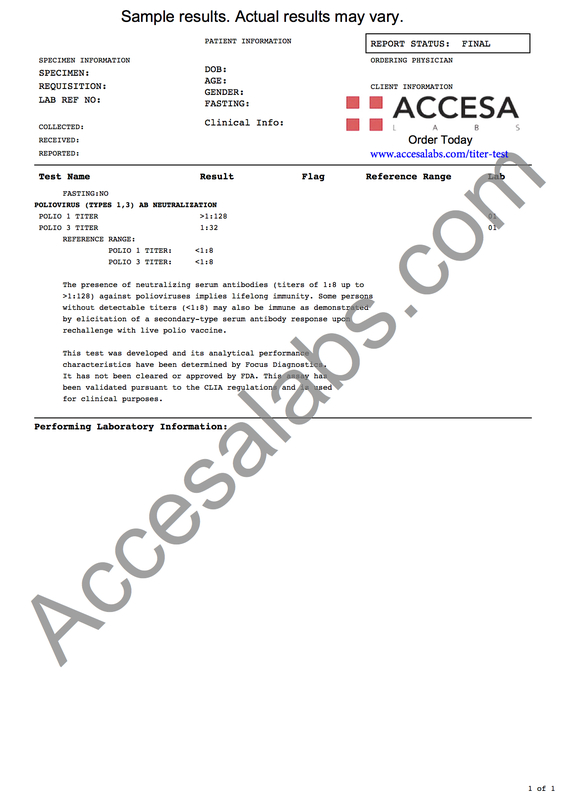 This polio lab test reports quantitative polio IgG antibody results for poliovirus types 1 and 3. Getting a polio titer near you involves a simple blood draw that can be performed at most Quest Diagnostics lab locations. Once the blood is drawn, the polio antibody levels are measured to see if the immune system has antibodies specific to the poliovirus. If poliovirus antibodies are detected, the polio titer results will show that on the final lab report. The presence of an adequate amount of antibodies to polio on the blood test result suggests immunity to poliovirus. When someone has adequate poliovirus antibodies in the blood, it means that their immune system is familiar with what poliovirus looks like and has the immune memory to fight off an infection should contact with a person infected with the poliovirus occur. For many people, interpreting polio titer lab results might seem like a daunting task. Fortunately, understanding polio test results is easier than it might seem at first. On our sample polio antibody lab report, for example, polio 1 antibody levels >1:128 and polio 3 antibody levels >1:32 have were reported by the lab (please reference the report for more detail). These polio blood antibody lives imply immunity to those poliovirus strains because they are above the reference ranges which imply no immunity. Polio antibody levels lower than the reference ranges for immunity provided by the laboratory suggest that one needs to receive the polio vaccine again. Typically, if polio blood titer results are positive, that is consistent with polio immunity. The polio test that we offer checks for immunity to the poliovirus but does not check if one is infected with the poliovirus. In most cases, the highest quality lab test to look for the poliovirus is a stool test with two specimens collected 24 hours apart. If polio stool testing is not an option, throat swabs are another way to collect specimens for analysis. In rare circumstances, cerebrospinal fluid (CSF) may be collected and analyzed for the existence of poliovirus in a patient. Once the appropriate specimens are collected, a lab testing method known as polymerase chain reaction (PCR) is used to try and find any polio virus present. Poliovirus, which causes polio, is an infectious RNA enterovirus that can take over a cell's genetic material and use it to start replicating. Typically communicated through contaminated food or water, the poliovirus incubates in the body for up to 3 weeks before expressing itself. From its initial presence in the gastrointestinal (GI) system, the poliovirus will spread into the bloodstream, enabling it to infect all parts of the body. In most healthy people, a polio infection will cause no or minor symptoms such as are found with the flu. In a small percentage of people, however, the poliovirus will infect the nervous system. Spreading through the nerves, the polio virus will destroy specific neurons and parts of the system, leading to major side effects such as paralysis in addition to neck stiffness and fever. While similar to conditions such as chronic fatigue syndrome, polio infections in the nervous system progress in severity and can also lead to muscle weakness over time. Unfortunately, once at this state, polio cannot be treated although some cases of paralysis end up being temporary with recovery within one year. While research continues in this area, there is no cure for polio at this time. Because of this, the medical management of poliomyelitis involves supportive care that treats any symptoms such as fevers but otherwise helps affected people stay comfortable. The development of the polio vaccine in the 1950s was a big step in the effort to eradicate polio. The first version was a live weakened virus but was subsequently replaced by an inactivated vaccine developed by Jonas Salk. The Salk vaccine was highly effective and almost every person who received it developed immunity to polio. Later in that decade, a new oral polio vaccine was developed (the Sabin vaccine) which was widely adopted and helpful in advancing eradication efforts. Targeted by health organizations such as the the World Health Assembly, wild poliomyelitis was almost completely eradicated worldwide by the mid 1990s and continues to be under control. 1. Modlin J, Wenger J. 2014. "Achieving and maintaining polio eradication--new strategies." Expert Rev NEJM 16(371):1476-1479. 2. Patel M, Zipursky S et al. 2015. "Polio endgame: the global introduction of inactivated polio vaccine." Expert Rev Vaccines 14(5):749-762. 3. Bandyopadhyay AS, Garon J et al. 2015. "Polio vaccination: past, present and future." Future Microbiol 10(5):791-808. 4. Farkas A, Maygar N et al. 2015. "Comparative study of antibody levels developed by vaccination against polio virus in population after vaccine type alteration." Acta Microbiol Immunol Hung 62(1):75-85. 5. Habib M, Soofi S et al. 2013. "A study evaluating poliovirus antibodies and risk factors associated with polio seropositivity in low socioeconomic areas of Pakistan." Vaccine 31(15):1987-1993. Polio Titer at Guaranteed Prices.